Fall prevention on the job site is a main priority for all of us in the roofing industry. A careless mistake or faulty equipment can lead to disastrous outcomes, and likely most that you know in the industry have been touched by an avoidable tragedy. In both commercial roofing and residential roofing, the job site can change as fast as the work progresses across the roof. Roof systems have different designs across the entire top of a building, especially in large commercial work. The best way to combat the safety challenges that arise is to be prepared with safety equipment that will provide adequate protection. Making sure that your crews have the equipment they need, and that the safety equipment is of a trusted quality that can withstand use as well as harsh jobsite wear and tear, is essential. You and your crews can keep the job on schedule without delays or costly fines. The BRFK 25 Fall prevention kit is an ideal line up that covers all the OSHA designated essentials in fall prevention, in one convenient kit. The kit itself is stored in a plastic bucket, which is ultimately reusable but also provides protection for the kit while not in use. The BRFK25 Fall Prevention Kit includes the safety harness (Full body, adjustable) as well as the shock absorbing lanyard (25 feet) and the rope grab. 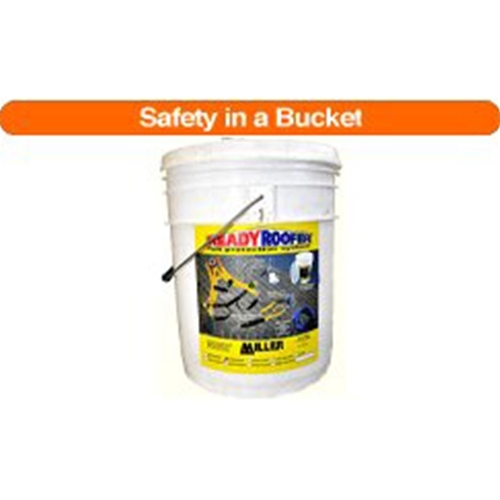 Rounding out the line up is the roof anchor that can be reused, and comes with the screws included. A 50 foot lanyard option is also available with the BRFK50. Ideal recommendation is to order 1 kit per worker, to ensure proper coverage for work use as well as for any regulation inspections. To place your order, or to learn about similar comparable kits, contact the pros here at Intech Equipment and Supply today!